HSE's Legal (or 'L') series of publications all contain the Regulations in full, plus guidance in one, clear document. Some also contain the Approved Code of Practice (ACOP), which has a special legal status. These seven stand out as being useful across industries. 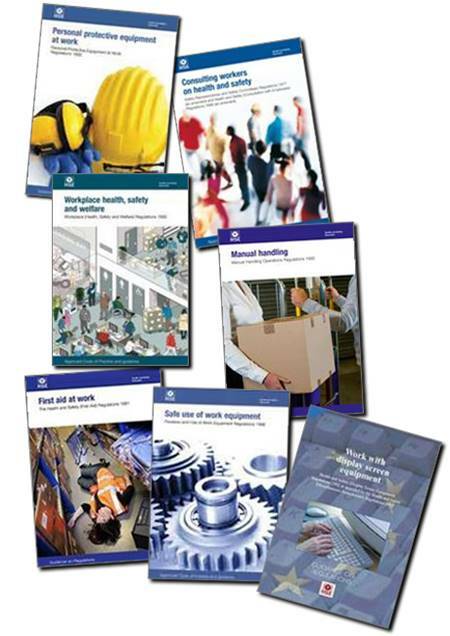 Here is our Health and Safety Manager pack, providing you with seven essential L titles and saving you 20% on the collected price of the individual publications. The Regulations, commonly known as PUWER, place duties on people and companies who own, operate or have control over work equipment. PUWER also places responsibilities on businesses and organisations whose employees use work equipment, whether owned by them or not. This guidance is mainly for employers, managers and safety representatives, but may also be useful for employees. Employers must comply with the Manual Handling Operations Regulations 1992, as amended by the Health and Safety (Miscellaneous Amendments) Regulations 2002. The guidance explains how to avoid, assess and reduce the risk of injury from manual handling. Scoping the main health risks associated with display screen equipment (DSE) work - including musculoskeletal disorders, visual fatigue and mental stress - it provides solution-based advice on avoidance and best practice regarding treatment and rehabilitation where they exist. cases where first-aid regulations do not apply. This book gives you the law and guidance on how to consult and involve your employees and their representatives on health and safety matters at work. It explains the relationship between the two sets of regulations and how they affect you and your workforce; in some workplaces you may have to consult under both sets of regulations.